I feel very fortunate to live on a lake with a healthy Perch population and it happens to be one of my favorites. I generally grill my fish but on those occasions when I hunger for crispy, golden fried fish, I have come to rely on healthy options. A few years ago, I was able to lose a lot of weight by limiting my intake of bread, baked goods, and sugar. Many refer to this as Paleo, or the caveman diet. It really wasn’t that difficult at all except that I love bread & pasta. I simply cut back. I previously shared a recipe with you for Paleo banana-nut muffins. (Love those things) It’s a healthy way to cheat. As I was getting ready to prepare my Perch, I thought about using almond flour instead of regular all-purpose. I was thrilled with the results. 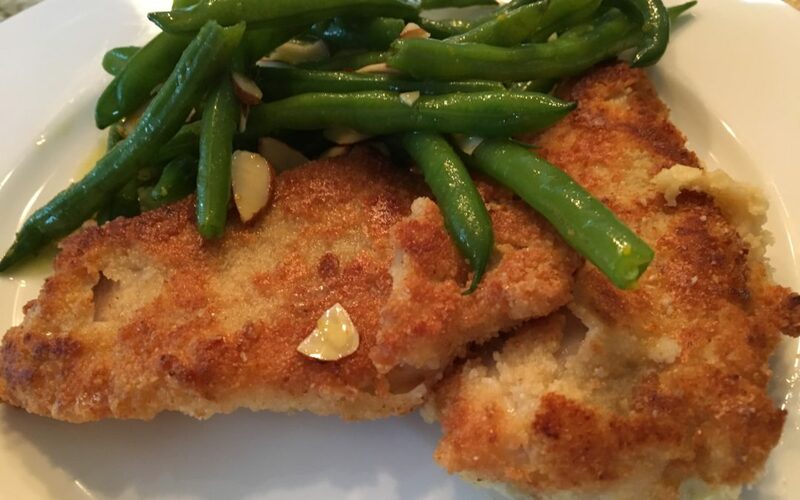 I achieved that wonderful crispy texture and beautifully golden fillets and it couldn’t have been easier. and place in the hot oil. When the fish is golden brown on the bottom, flip em. Done! Then I shocked them in an ice bath to preserve the bright green color and to stop the cooking process. I dried them thoroughly when chilled and made a simple vinaigrette to dress them with. You may substitute coconut flour and coconut oil if any of your dinner companions have a nut issue.